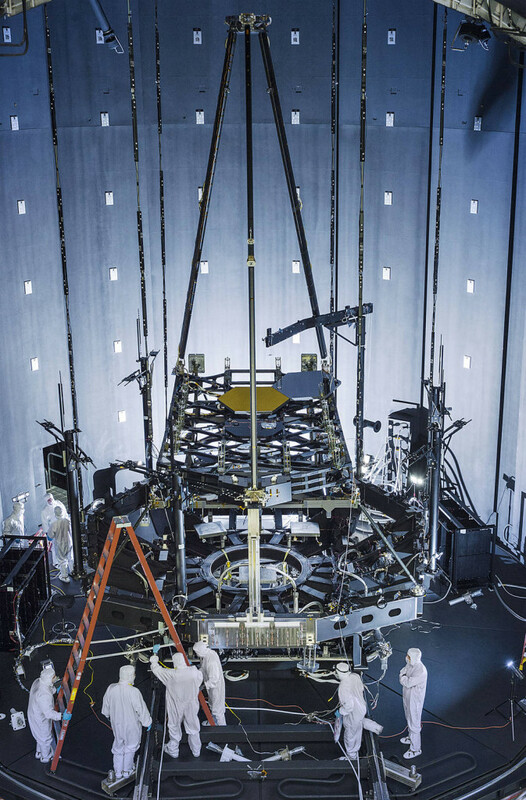 April 20, 2015 – Inside NASA’s giant thermal vacuum chamber, called Chamber A, at NASA’s Johnson Space Center in Houston, the James Webb Space Telescope’s Pathfinder backplane test model, is being prepared for its cryogenic test. Previously used for manned spaceflight missions, this historic chamber is now filled with engineers and technicians preparing for a crucial test. The Near Infrared Camera (NIRCam) instrument for the James Webb Space Telescope (JWST) is being developed by Lockheed Martin, under contract with the University of Arizona. NIRCam is the primary science camera on JWST, and also functions as the sensor that is used to align the observatory’s primary mirror, built by Ball Aerospace. JWST will see farther into the cosmos and further back in time than any other telescope.